A group of students about to take an art exam standing in front of promotional posters for Fushun, China. February 2018. As a sub-zero blizzard raged outside, Ronghui Chen pushed open a glass window to let in a gust of cold air. Over three successive winters, he worked on “Freezing Lands,” a collection of large-format photographs that explores contrasts. The cold conveyed the desolation of towns and cities whose populations are shrinking as people leave the region for education and work in bustling cities, just as Mr. Chen had done himself. The young residents spent their winters in warm and brightly painted interiors, uncertain about the future. 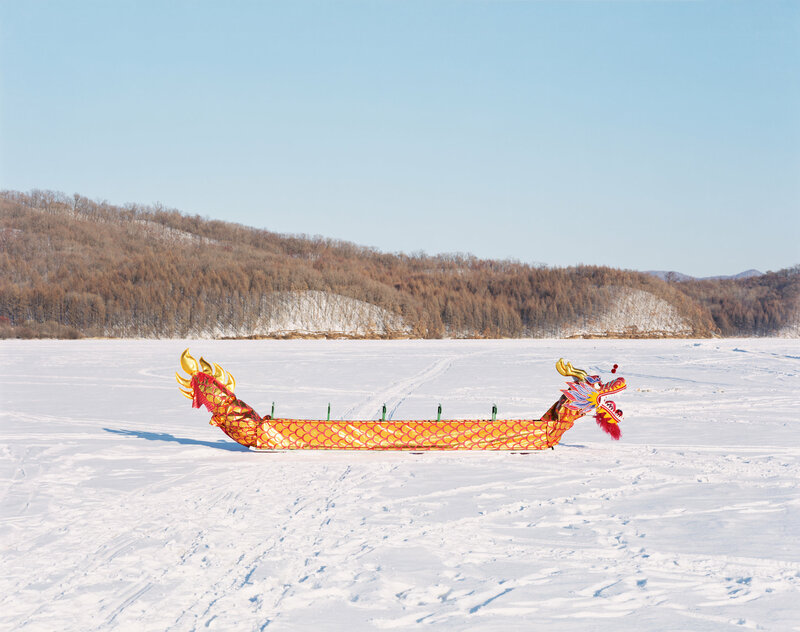 A Chinese dragon boat on the frozen Yichun River in Yichun, Heilongjiang Province, December 2016. Yichun was once known as China’s forestry capital, but today, its government hopes to boost the economy through tourism. A hotel in Longjing, Jilin Province, on the border with North Korea, which provides telescopes that can be used to observe life to the south. February 2017. Two junior high school students learning how to smoke outside school. Fularji, Heilongjiang, February 2017. The city’s loss of higher education institutions has darkened the prospects of its young people. Many migrant workers are not recognized as permanent residents in the cities they move to, nor can they receive the same social benefits or government subsidies. But even for those who have remained, or returned after studying or working in bigger cities, the question of whether to leave or stay is never far from mind. Between 2000 and 2010, the population has fallen in about 180 cities, according to a 2016 study, as many residents searched for work elsewhere. In northeastern townships and cities that once housed bustling factories, power plants, and mining and logging operations, natural resources are depleting, the gross domestic product is dropping and business prospects are all but disappearing. Mr. Chen is perhaps best known for his photographs of so-called Christmas factories, where migrant workers made Christmas stockings, snowflakes and plastic reindeer in workshops filled with red glitter all year long. Their grim daily labor was a surreal clash with the holiday cheer they manufactured. One portrait in the collection earned Mr. Chen a second-place World Press Photo Award in 2015. The recognition came with the prize of a large-format camera, signaling a turning point in Mr. Chen’s practice. “Freezing Land” is his second project shot in large format. A Yi, the only female tattoo artist in Yichun, Heilongjiang Province. December 2016. The Huan twins, 22, of Fularji, Heilongjiang, in February 2017. They said that they didn’t make any money from selling clothes that year, and that they planned to move to Zhejiang Province. “As a journalist, you aspire to capture images quickly, leaving the thinking to a digital camera,” he said. In contrast, the slow-moving technique of large-format photography allows him to pay closer attention to his subject and to capture a sense of uncertainty. 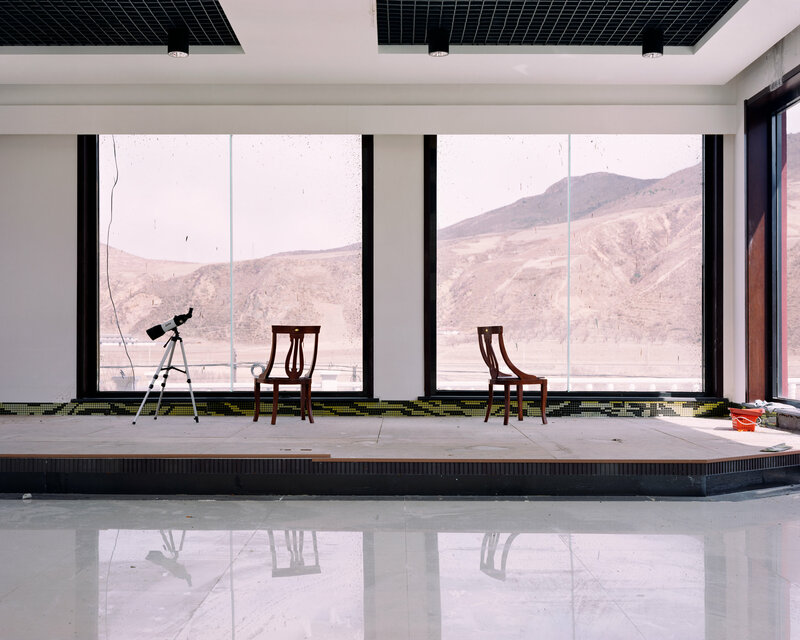 The considered technique required by large-format photography matched his approach to the project, which began as a photojournalistic assignment but veered into more personal territory. On his first day in the snowstorm, he turned to Kuaishou, a short-video app particularly popular in the region, to find young people to photograph. Some were personable and witty entertainers who made their living through live-streaming; others searched for drinking companions after returning home from university. Yuting, 10, on the bank of the Hun River with a bouquet of artificial flowers to be used to decorate ice sculptures. Fushun, February 2018. Yao Le, 20, with his girlfriend, 16, is an internet celebrity from Fularji who raps on video-streaming apps. Many young people in Fularji have turned to online streaming for economic opportunities. Huang Shu, a local hunter, in Yichun Taoshan International Hunting Field. December 2016. He spent three winters visiting the Northeast a week or two at a time, expanding the project to five cities: Yichun, Longjing, Fularji, Fushun and Shuangyashan. Departing from pure documentary photography, Mr. Chen focused on what stood out to him and touched his feelings, rather than making an objective account. Originally from Lishui, a temperate village in the eastern province of Zhejiang, Mr. Chen saw photography in the punishing weather as a test of endurance. The large-format camera could feel like a ball of fire to the touch, and there was also the lugging of equipment on slippery ice. But Mr. Chen said it was crucial for him to walk in the shoes of his subjects, to see the difficulty of life in the cold. When he first arrived, he was struck by the strong glare on the snow that piled in thick layers outside his window. His eyes stung, blurring his vision. But the closer he looked, the more he saw his own story reflected. “Snow is very beautiful, but it can conceal a lot of things,” he said. Ziyi, 22, standing in front of a car her parents bought her in Yichun, Heilongjiang Province, December 2016. She was considering moving to Beijing, but she worried about having to live in a smaller apartment there. Huang Ping, left, a student at a local vocational high school where many students earn money performing online, and his roommate hosting a live-streaming session in Longjing, Jilin Province, February 2017. “I’m a volleyball player at my university, and I don’t want to leave my hometown.”Ling, 19, Longjing, Jilin Province. March 2017. Five ethnic Korean children prayed in a local church in Longjing, which borders North Korea and is home to a large ethnic Korean community. February 2017. Colorful fake trees planted by the government on the frozen Yichun River in Yichun, Heilongjiang. December 2016. NYT: Young People Left Behind in China’s Snowbound Rust Belt.